Most people have heard about the magical furniture land that is IKEA. 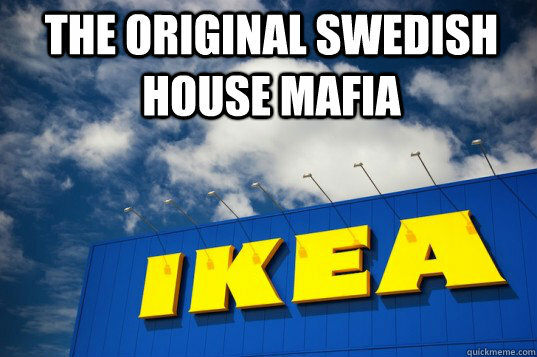 But what really is IKEA? Besides a haven for meatball lovers, maze fans, and anything and everything you might need for you home, it’s a spot with much dirt to be uncovered. You’re so lucky you have us. 1. What does IKEA mean? IKEA is the first 2 letters from the founder’s name (Ingvar Kamprad), and the first letters from the name of the farm (Elmtaryd) and village (Agunnaryd) where he grew up in Sweden. 2. The IKEA Catalogue might just be holier than the bible. Just kidding. However, each year, more copies of the IKEA catalogue are printed than the Old Testament. Over 180 million readers (speaking 27 languages!) enjoy thumbing through pages and pages of of Swedish furniture each year. 3. IKEA’s favorite thing to consume is – not meatballs – trees! Behind Home Depot and Lowe’s, IKEA is a major consumer of wood, worldwide. OK, so you’re not impressed. That’s 1% of the world’s TOTAL wood consumption, which is equivalent to 17.8 million cubic yards of wood, per year. We just checked, and being environment friendly isn’t part of IKEA’s mission statement. 4. IKEA does not shy away from diversity. IKEA was the first company to feature a homosexual couple. The commercial first aired in 1994. After its release, the company received a threat, forcing the ad to be pulled. Since 1994, IKEA has explored other diverse commercial ideas, mostly appealing to the LGBTQ community. 5. The names of all the furniture aren’t just random, cooky Swedish words. If you’ve read Girl With the Dragon Tattoo and noticed some similarities between the names of characters and the table you just bought, you’re not crazy. Ingar Kamprad is dyslexic, and when classifying furniture for his store, he opted to use categories of Swedish, Finnish, Norweigan, and Danish words and places to describe different furniture pieces. Already planning your next IKEA trip? Check out some stylish IKEA hacks that will help stretch your dollar.